A well laid-out garden can add significant value to your home, but the costs of good landscaping can soon mount up. Just as with interior fixtures and finishes, your choices are almost limitless, but this can complicate the design process. Should plants be a priority, or hard surfaces? Should you lay turf, paving, or something else? In short, how can you get the best garden for your money? Creating a plan of your existing plot is a vital first step. It will help you to picture how the garden will be used, how the work should proceed, what materials are required and, in turn, work out a budget. It will also sharpen your focus on some important features of your plot, such as aspect, exposure, privacy, sun and shade. There are many free design tools online (Google SketchUp is a prime example) which aren’t too difficult to use and will allow you to create your own plans and even scaled-up 3D models. Start by taking accurate measurements of your garden, noting any features you wish to retain. Also make a note of which areas are in sun or shade at various times of the day. Before you start to lay out the plot, get together with other family members who’ll be using the garden and draw up a list of the features that you’d all like to include. At this early stage, include everything from practical must-haves (shed, compost bins…) to items you’d include if you had unlimited funds (a hot tub?). Number all these features in order of their importance, to build a clearer picture of the garden you’d like to have and how you see it evolving over the coming years. 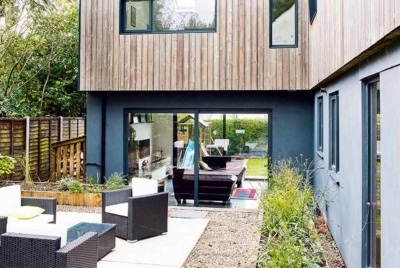 Building-in the opportunity for your garden to grow with you can save a major redesign (and thousands of pounds) in the long run. For example, a pond, rill or other water feature can provide a great focal point, but if you have toddlers you may prefer to earmark space for these projects but delay building them until your children are older. If you plan on having a productive garden, your priority might be to get fruit trees and an edible hedge planted so that they start bearing crop as soon as possible. Again, you might not be able to afford that hot tub now, but you could put the plumbing in place in advance. This will save considerable effort and money when you’re ready to install. a space where plants take centre stage. Unless you want a very formal garden, it can be useful to build asymmetry into your plan and incorporate diagonal lines. This will make the space look bigger and more dynamic. Try to include at least some change of level; this makes a garden far more interesting and can provide privacy and more planting options. What’s more if you are landscaping a self build, a raised area can be a good means of utilising some of that excess soil excavated when the foundations for your new home are dug (saving on the costs of transporting spoil away). Ensure the style of your garden and the materials you choose are in keeping with the style of your home, too. Repeating visual cues such as key shapes and materials can lead to a harmonious scheme. Also take time at the outset to consider how you want to edge the space — are there nosy neighbours or traffic noises you want to shield? Or, is there a special view you want to maximise? Building these ideas in at the outset can help you keep a handle on costs. Once you have a plan, you’re in a more informed position to decide where you can save money by doing work yourself, and where it may be better to use professionals. Their expertise can be valuable when it comes to more complex tasks such as building walls, and they may also have good contacts for getting cheap deals on materials and plants, so it’s worth getting detailed quotes. You can make big savings by laying out all your paths, patios and seating areas at once. Some online retailers sell complete paving kits and project packs, and the price may include delivery by a tail-lift vehicle to a hardstanding area. Compare costs carefully — if you’re prepared to shop around, you can get great deals during sales. Draw up a spreadsheet and make sure you factor in delivery costs and bulk buying discounts where applicable. Builder’s merchants, such as Buildbase, could be another good place to seek out lower prices, particularly if you have an account and are buying other materials for your project. It’s a wise idea to look at all the alternatives, and consider if substitute materials might be better value for money (although do keep a careful eye on quality; more on this later). If you have a children’s play area, for example, it may be cheaper and more practical to put weed-proof membrane down and cover it in wood chip, rather than invest in high-maintenance and expensive turf. Or, you might find an off-cut of good-quality astroturf online as a perfect short-term measure, while the kids are growing up. Time spent getting to know the type of environment you have, and learning how to maximise its potential, is far better than attempting to turn your plot into something it can never be. A sloping site can be terraced relatively simply with rows of sleepers, creating an attractive feature and making it much easier to garden. This could save a huge amount on skips compared to digging out the soil to level it. If your plot has an area that is always damp, instead of trying to ‘fix’ it, consider making it into a bog garden. Plant it with architectural plants such as gunnera, candleabra primula, fern and astilbe. If you have a windy coastal plot, plan a windbreak line of attractive shrubs and trees, such as tamarisk and Rosa rugosa, that will thrive in those conditions and provide shelter for stylish maritime plants such as sea holly, sedum and armeria. Just one or two big trees or shrubs can make all the difference when it comes to getting an established look, so aim to conserve any decent specimens that are already on your plot. If you have trees or shrubs that look a bit tatty, bear in mind that a bit of judicious pruning could easily transform them. With really large plants or trees, you can prune one half one year and the other half the following year to keep them in good health while you get them back into shape. If you’re uncertain as to what the existing plants on your plot are, get a green-fingered friend round to advise. If they spot decent specimens that are in the wrong place, it’s wise to move them. This should ideally be done in winter or spring when they are dormant, but most plants can be moved even in summer. Prepare the new planting hole first. Dig up the plant with as much earth around the root ball as possible. Place it straight in the new hole and water well until established. Alternatively, you can temporarily put them in large plastic pots as long as you remember to water them regularly. Planning ahead is key to making your money go much further when it comes to planting. First, it’s vital to research how many plants you need and what will fare well in the various locations you have in mind. If you can’t afford many at first, focus on the area close to your house and develop other beds gradually. If your soil is poor after building work, consider getting top soil and well-rotted manure delivered for your flower beds and vegetable garden — don’t waste time and money trying to grow plants on unsuitable ground. Always look at the eventual height and spread of your selected options, too. If you have the luxury of time, one way to save money is to buy bare-rooted plants. These are available from November to March, when they are dormant. Not only are they cheaper than plants in pots, they are available by mail order so you can choose from a huge range of trees, shrubs and perennials direct from specialist growers. Perennial plants are also far cheaper than annuals in the long run as the former last for many years, while annuals need to be replaced each spring. To achieve an established look in a short space of time, plant perennials in sets of three or five, rather than dotting them around randomly. Another great budget option is to grow plants from seed. Even a complete beginner can have great results with simple annuals such as nasturtiums, sunflowers, nigella, calendula, cosmos and poppies. Clear the ground of weeds and plant seeds in drifts for the best results. ‘Good value’ is not simply a case of buying the cheapest materials available. In fact, with some elements of the hard landscaping such as decking, a little extra investment (and maintenance) can mean the difference between a deck which looks past its best in a couple of years, and one which provides many years of good service. “A well-maintained deck made from high-quality materials can provide decades of trouble-free performance. 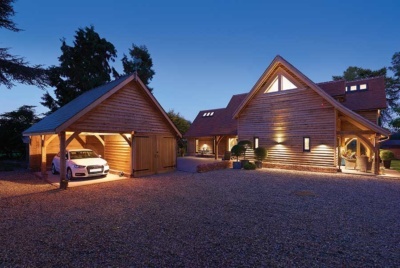 However, as with most products, when it comes to decking you certainly get what you pay for,” explains Nick Taylor, Managing Director of Silva Timber. You should also make sure you maintain your purchases properly. 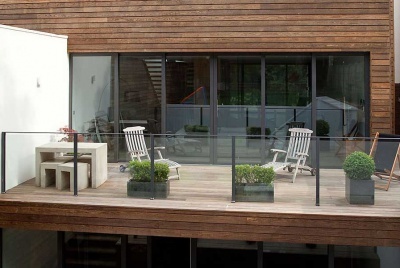 In the case of decking protect it from ultraviolet and water damage with a penetrating oil (such as Sansin Dec). Do the same with garden furniture to make sure your investment lasts. The Timber Decking Association is a good source of information on all things decking, including specification, design, installation and importantly, maintenance — visit tda.org.uk for more. 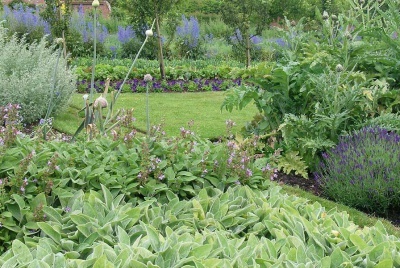 What are your top tips for designing a garden which won’t cost you the earth? I’m planning to renovate my garden next spring, and this article will come to good use to me. Thanks for sharing these tips!